enhanced colored tamriel map extension using dynamic map mod. no esp! this map has an enhanced but performace friendly size to cover even more relevant tamriel world space with one zoomable map. you will find all your oblivion mod mapmarkers on this map, including hammerfell, skyrim, morrowind, black marsh and somes isles. for everyone who likes the nice ones dynamic map mod but would like to have an extended colored one piece big map variant. 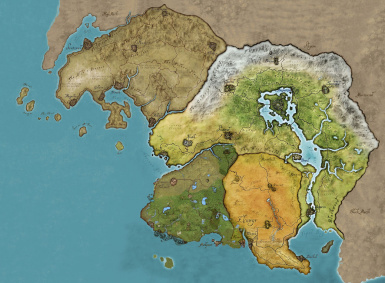 i merged standard colored cyrodiil map with valenwood and elsweyr colored maps because there is no simple to install extended colored extended tamriel map including all important mapmarkers out there. i added some valenwood landscape lod information to offer accurate valenwood map boundarys. 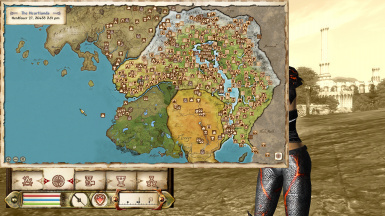 currently the elsweyr map does not exactly match the elsweyr anequina mod boundarys in the south (the senchal part). this map is handmade and not perfect in every detail. despite all that i hope you find this extended map convenient and useful. if you are very fast activating the tamriel map the map markers could be erraticly shown. just open and close the map once again and everything should work as intended. some words to the bundle of twmp mods - just to be warned. the twmp project was very ambitious but in my opinion not consequently realized. after testing a lot of configs i must say i found no config without twmp related landscape gliches but with a lot of ctd's and instabilities if all twmp mods run together. i recommend to install the non twmp standalone versions of these mods (hammerfell, valenwood, etc). it is not perfect but it's far more stable and works also nice with my extended map. just let this mod overwrite the dynamic map world textures and the dynamic map.ini settings!